What does it take to be a classic? How can one create something so timeless that it remains in the heart and souls of people forever? Well, the hip hop group Arrested Development have executed this very element quite nicely for over two decades. Celebrating their 20th anniversary here in Sydney, performing at the Cockatoo Island Film Festival, this legendary group will rock the stage once again with their eclectic Afrocentric hip hop style. Along with their classic hits, this two-time Grammy award winning group has come out with a new album this year as a tribute to their long lasting career and their faithful fans. Speech, the co-founder of the group, joined me in a phone conversation and expanded a bit on the past and present of Arrested Development. This year marked 20 years since Arrested Development dropped their first album 3 Years, 5 Months & 2 Days in the Life Of… and they’ve decided to celebrate with a world tour not only in the US, but hitting countries like Japan and of course Australia. 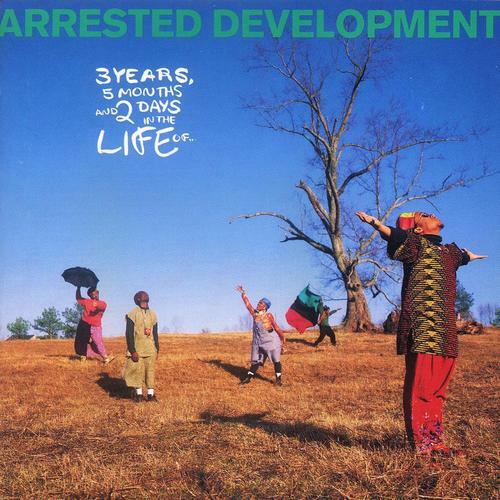 With their fame still spinning off of their most famous classics such as Tennessee, People Everyday and Mr. Wendal, Arrested Development is still going strong and have produced a 10th album entitled Standing At The Crossroads. “A lot of this record was written right after we got off stage so some of the lyrics literally describe what we just felt being on stage at that moment,” Speech explains. What’s special about this album isn’t just the fact that it’s a celebratory piece, but they’ve allowed all 13 tracks of this album to be available free of charge to the public. Speech named his top two favourites on the album with the first being lead single Raga in Coolangatta. The song was created by their guitar player JJ while they were in Coolangatta, Australia. It is based off what Speech describes as “a beach town, totally nice weather…the rhymes were totally organic and feel good rhymes and it just totally matched the place we were at the time.” The second single he mentioned is called Living, which he defines as being about how everybody makes mistakes but has a chance to correct the faults in their lives to move forward. It’s not every day a person gets a hold of a legendary artists, so while I had Speech on the line, I figured he wouldn’t mind digging into the past times and filling me in on how Arrested Development came to be. Upon hearing the first and most famous hip hop song ever created, Rapper’s Delight, Speech states, “I was blown away by the fact that was there was no singing on the record, the whole record was just people talking. It felt like the coolest thing I have ever heard in my life.” Another major part of his inspiration came from “the whole idea of scratching and mixing records” first heard from Grandmaster Flash—this made him want to have a life commitment with hip hop, and down the line put together the illustrious group Arrested Development. Attending the University of Wisconsin at the time, Speech and fellow group member Headliner started Arrested Development in Atlanta, Georgia and there he met the rest of the crew. Being black in America was still a great challenge when they started, but according to Speech the group had a specific intent, “I wanted it to be positive… I wanted it to talk about a lot of the issues that are affecting us here in America, especially in the black community where there’s a lot of crime, killing, and injustice with the system. We wanted to talk about that stuff and make it relevant, spiritual and uplifting.” The group began to put on street performances, which included such festivities as painting and playing African drums. Speech described the atmosphere of these performances as, “a celebration of life, death and the struggles of the ancestors” as mentioned in the song People Everyday. Having a lot of history in Sydney and it being one of their favourite places, Arrested Development will be hitting the stage on Thursday, October 25, 2012. Along with their anticipated performance, Arrested Development will also be celebrating Speech’s birthday, so there will be special surprises that apparently no other audience during their tour stops will see. An Arrested Development stage performance is no small thing so get ready for upbeat, diverse, funky sounds and much participation from the crowd.